If you’re having trouble writing, it’s likely you just don’t know the proper steps to take or might be lacking direction. While there is no magic formula to writing a good screenplay, I think there is a helpful order to doing things. Of course, some may just want to throw order out the window as it can be hindering to their thought process. I found a great 10-part series on “Go Into The Story,” and I’m going to be sharing them week by week. This week, we’ll be talking about plot, and how that may benefit you. You really should read their posts before diving into my commentary on them. I’m a big fan of these blog posts, and only hope to promote this blog in a friendly way. I’ll be commenting on the posts, and adding some thoughts of my own. I’m hoping to share them with you to help you with your writing. On another note, look up top! I put a fancy picture up for you in the post today. I think this is a helpful way to look at the basic three-act structure. It’s the classic way, but it’s not the only way to write a story. 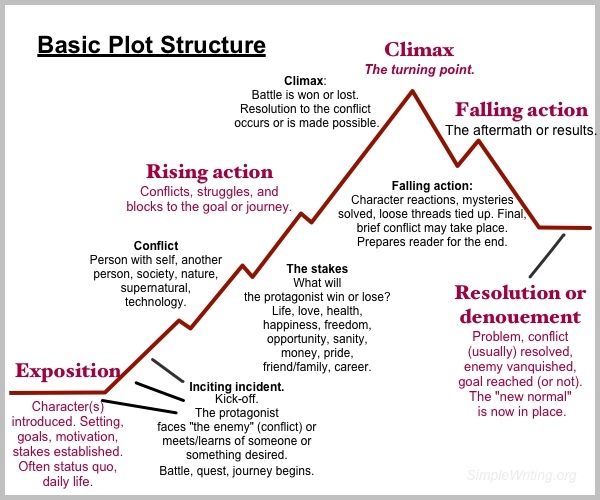 For those of you looking for help with plot, I have another great post about it here: “Shakespeare’s Five Act Structure.” It’s all about “Breaking Bad,” and how the writers of that show approach plot using the Shakespearean Five Act Structure. One thing you should keep in mind is that each format can be written differently. Television, for instance, has been written with more acts to keep you hooked and watch through the commercials, whereas movies are typically written with a three act structure. A lot of professional writers I’ve seen like to have their plot visually displayed. It’s very helpful, especially if you’re in a Writer’s Room. If you’re writing on a collaborative project, a great way to work is to write on cards, like the article mentions. It’s very easy to point to a card and show another writer exactly what you’re talking about quickly. It’s also easier to avoid plot holes when you have everything in front of you. Another great option is to use Google Docs. I love it, and it has some great features for collaboration. If you can’t be in the same place at the same time you can jump on Skype and run through the doc and leave notes in specific spots. This is a bit of a different approach that I prefer to use. Both are great options, but I especially like using technology because you can access this doc from your smart phone or computer anywhere at any time and add to it. I just love the convenience. Brainstorming, research, character development, and plot will all feed off of each other and go into the outline. This is how we organize all these thoughts. Remember to have fun and enjoy this process. Let your creative juices flow for now, and next week we’ll discuss the outline in more detail. For now, if you haven’t, you should check out the articles provided. They’re full of very helpful information.